With most sports cars, you will have to make a sacrifice. Some coupes come with moderate horsepower and no room for second-row passengers whatsoever. Some luxury brands will make you break the bank with the starting cost for their sports cars. But the 2019 Kia Stinger has more power than a weak-willed convertible and easily glides into a nice price range that makes premium performance both affordable and enjoyable. Because with the Kia Stinger, adventure isn’t an option, it comes as a standard feature. And the new 2019 rendition of the Stinger comes with blazing speeds that reach as high as 167 MPH, but also has the space in back for your bags and the technology necessary to soundtrack your every drive in sheer style. Read on for some of the model specs and features of the 2019 Kia Stinger, available at Family Kia of St. Augustine, also serving the Jacksonville and Palm Coast FL areas! Five trim options: 2.0L, Premium, GT, GT1, GT2. 0-60 in 4.7 seconds in GT, GT1 and GT2 trims. Base fuel economy: 22 MPG city, 29 MPG highway. Available AWD in all trims. Android Auto and Apple CarPlay, standard. Cargo room: 23.3 cubic feet. 255 base HP, 365 HP in GT, GT1 and GT2 trims. Interested? Then please call us at (904) 808-0542 or visit us on the lot for information about the 2019 Kia Stinger or to take this sports car for a test drive. In addition to all these benefits, all Kia models come with industry-leading 10-year / 100,000-mile warranty coverage. Test Drive a 2019 Kia Stinger at Family Kia of St. Augustine! The 2019 Kia Stinger comes with the bold design and high-octane performance you require from a sports car, with a roomy interior and Kia’s established tradition of cutting-edge technology features. 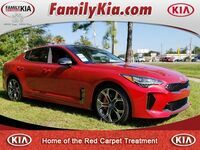 If you’re interested in the Kia Stinger, come visit us on the lot and we’ll answer any questions you have or set you up with a test drive of your favorite model at Family Kia, located at 2665 U.S. Highway 1 South, St. Augustine FL.